Please join us for our Ash Wednesday Worship Service with the traditional imposition of ashes. 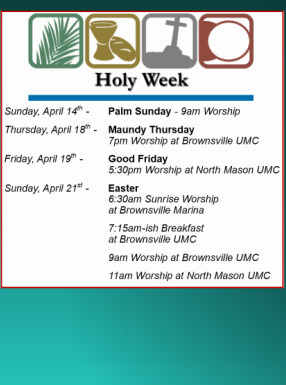 Brownsville UMC and North Mason UMC will be holding a joint worship service with a potluck meal to follow. The service will be held at Brownsville UMC at 10am. The Potluck: Brownsville Congregation will be providing the meat & main dishes and North Mason UMC will be providing the side dishes & desserts.